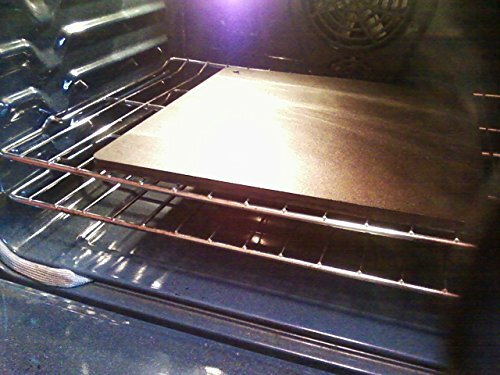 The Dough-Joe® Emperor Pizza SteelTM Baking Sheet is a very heavy pre-seasoned carbon steel sheet of 15" x 15" x 1/2" that provides results comparable to wood fired ovens in your home oven due to the incredible heat conductivity you get when baking on steel. MADE IN USA--15" x 15" x 1/2"--made of carbon steel--pre-seasoned--IMPORTANT you need an average of 1.5" on all sides of your oven. Without enough clearance, your steel will get very hot while your air space above will not be hot enough to adequately cook the ingredients, resulting in badly burned crust. Fits perfectly on the Weber 22.5" grill. Pre-seasoned, which is why the dark color. Re-season only as needed. Steel WILL NEVER BREAK, and will last for a lifetime. EXTREMELY HEAVY--Actual Weight of the Emperor™ is about 32 POUNDS. Steel pizza stones deliver a huge amount of heat very quickly to your pizza or bread. Matte finish surface allows steam to channel away quickly and keeps a nice appearance. Color: Silver when unseasoned. Brown after seasoning. If you have any questions about this product by Falls Culinary, Inc, contact us by completing and submitting the form below. If you are looking for a specif part number, please include it with your message.